Description: Maj. Gen. Sterling Price’s march along the Missouri River was slow, providing the Yankees a chance to concentrate. 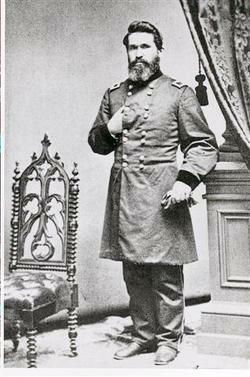 Maj. Gen. William S. Rosecrans, commanding the Department of the Missouri, proposed a pincer movement to trap Price and his army, but he was unable to communicate with Maj. Gen. Samuel R. Curtis, commander of the Department of Kansas, to formalize the plan. Curtis was having problems because many of his troops were Kansas militia and they refused to enter Missouri, but a force of 2,000 men under the command of Maj. Gen. James G. Blunt did set out for Lexington. On October 19, Price’s army approached Lexington, collided with Union scouts and pickets about 2:00 pm, drove them back, and engaged in a battle with the main force. The Yankees resisted at first, but Price’s army eventually pushed them through the town to the western outskirts and pursued them along the Independence Road until night fall. Without Curtis’s entire force, the Yankees could not stop Price’s army, but they did further retard their slow march. Blunt gained valuable information about the size and disposition of Price’s army. The Second Battle of Lexington was a minor skirmish during the American Civil War, taking place on October 19, 1864, in Lexington, the county seat of Lafayette County, Missouri. It formed a part of Confederate Maj. Gen. Sterling Price's Missouri Expedition of that year, and led in turn to the Battle of Little Blue River two days later. Like the first Battle of Lexington, fought in September 1861, this engagement resulted in a Confederate victory. Its overall importance, however, was not nearly so marked as the first battle, which had cemented Southern control of the Missouri Valley and significantly raised Confederate morale in the region. After his victory at the Battle of Glasgow, Price continued his march westward, in the direction of Kansas City and Fort Leavenworth, headquarters of the Federal Department of Kansas. But his progress was slow, giving the Union Army a chance to concentrate their forces. Maj. Gen. William S. Rosecrans, commanding the Department of the Missouri, proposed a pincer movement to trap Price and his army, but was unable to communicate with Maj. Gen. Samuel R. Curtis, commander of the Department of Kansas, to formalize the plan. Curtis was experiencing difficulty because many of his soldiers were Kansas militia (under George Dietzler), and they refused to enter Missouri. 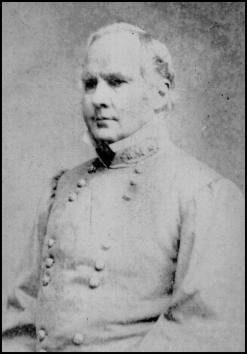 However, a force of about 2,000 men under the command of Maj. Gen. James G. Blunt did set out for Lexington. On October 19, Price's army approached Lexington and collided with Union scouts and pickets about 2:00 p.m., driving them back and engaging Blunt's main force. The Federals resisted at first, but Price's army eventually pushed them through the town to its western outskirts, then pursued them along the Independence Road until nightfall. Deprived of Curtis's entire force, still encamped in and near Kansas City, the Union army never stood any real chance of stopping Price's force at Lexington. Blunt did, however, further retard the Confederates' dilatory march, and gained valuable information about the size and disposition of Price's command. Blunt's retreating troops halted on October 20 at the Little Blue River, taking up a strong defensive position on its western bank. On October 21, however, Price's army would continue its successful—if ultimately short-lived—drive in the battles of Little Blue River and Independence. These triumphs would all be undone by the Battle of Westport on October 23, which saw Price's defeat and the end of his campaign, together with all significant Confederate military operations in Missouri.